The St. Louis Cardinals deleted a tweet on Tuesday that was sent from the team account earlier in the day that many viewed as sexist. 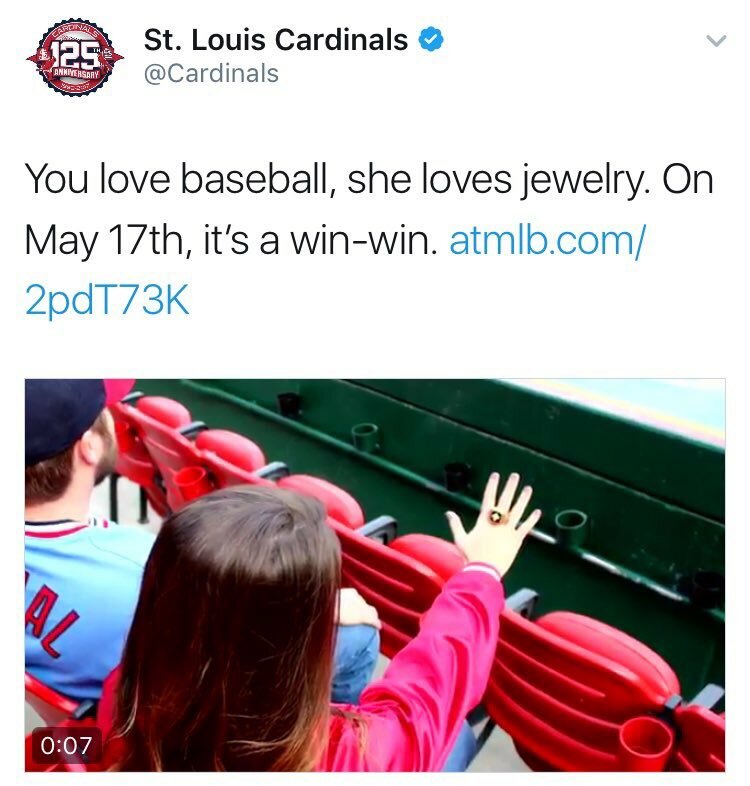 The message in question was promoting a May 17 giveaway of replica World Series rings -- but it implied that men who "love baseball" should obtain the gift for the women in their lives who "[love] jewelry." According to outraged fans, the tweet connoted that baseball and jewelry are mutually exclusive interests -- and women are bigger fans of accessories then they are of sports. Why do teams market women using wine nights and jewelry? We enjoy beer and watching bp just as much as Joe Schmoe. I'm a woman and I know more about baseball than my husband. Are we doing life wrong, @Cardinals ?? Please advise. I love baseball. He loves baseball too. We love each other because neither of us are @Cardinals fans. Women can (and do) enjoy and understand sports, a fact that seems to be lost on whoever is running the social media account for the St. Louis Cardinals. Unfortunately, this blunder joins a long list of gaffes by professional sports teams that alienate their female fans. Recently, the Edmonton Oilers of the NHL decided to convert some of the women's bathrooms in their home arena into men's bathrooms -- reportedly because "less guys are willing to give up their tickets" during the heated postseason, and there were complaints from men about long lines. Last year, the NBA's Dallas Mavericks advertised an "NBA 101" event for fans to "learn and understand the fundamentals of basketball," but branded it as an event only for women. The NHL's New York Islanders hosted a similar event in 2015 called "Hockey & Heels" which "aimed to teach the basics of hockey to attendees" -- but, again, it was clearly only meant for women. Multiple teams across professional sports are guilty of hosting "Ladies Night" events that attempt to attract women to the stadium or arena with gimmicks like fashion shows, Pinterest tips and feather boas, rather than to simply enjoy a game in the same way as their male counterparts. Female sports fans have been ostracized for years, but the sports world is no longer just a man's world. It's about time for organizations to realize that there is nothing abnormal about a woman watching a game -- or even playing in it -- simply because she enjoys it.